An 18-year-old burglar who vandalised a children's campsite building was caught because he wrote his name on a wall at the scene, a court has heard. Peter Addison, of Heaton Mersey, Stockport, and his friend Mark Ridgeway of Poynton, Cheshire, smashed crockery and let off fire extinguishers. Addison received a conditional discharge. Ridgeway, 18, must carry out 60 hours' unpaid work. Both pleaded guilty to burglary at Macclesfield Magistrates' Court. Addison was ordered to pay £725 compensation and £20 costs. Ridgeway has to pay £20 costs. Apart from writing his own name in black marker pen at the Toc H centre in Adlington, Cheshire, Addison also left his gang's name on the wall - The Adlington Massiv!. 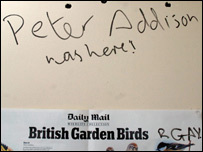 The teenager vandalised a Garden Birds of Britain poster by adding "R Gay". He then left a final message to the campsite owners - "thanks for the stay". Police found him after entering his name in a computer system. Inspector Gareth Woods, of Cheshire Police, said: "This crime is up there with the dumbest of all in the criminal league table. "There are some pretty stupid criminals around, but to leave your own name at the scene of the crime takes the biscuit. "The daftness of this lad certainly made our job a lot easier."